A year on from the initial launch of WhatsApp Business on Android devices – which the company says is now being used by more than five million businesses all over the world – WhatsApp has this week announced an iOS version of its WhatsApp Business app. Building on the messaging app’s business potential has become a key focus – the Facebook-owned tool is now the most used messaging tool in the world, at more than 1.5 billion active users. That puts it ahead of Messenger (1.3b), and well ahead of all other messaging competitors – which both underlines why Facebook is looking to put more focus on messaging, and why adding in more business tools has become an essential part of that push. Indeed, Facebook CEO Mark Zuckerberg recently outlined the company’s realignment around messaging, shifting in line with broader usage trends. As such, evolving WhatsApp’s business tools is a key plank of Facebook’s future vision, veering away from the public broadcasting of the News Feed and towards more private discussion. The challenge in that is making messaging a viable business option in order to replace the potential loss of revenue in lessening the value of News Feed ads. There are various ways Facebook could potentially do this, but again, WhatsApp may well be the flagship – and as such, the development and growth of WhatsApp’s business tools will be essential. For brands, the value of such will be relative – if you’re looking to reach users in certain markets, then WhatsApp will either be hugely important, or not so much. 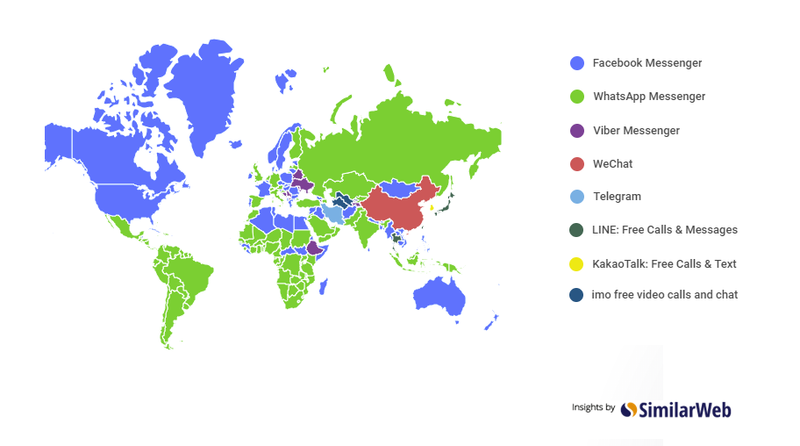 As you can see from the above map, WhatsApp is not the leader in most Western nations, but it’s huge in Europe and South America. If you were looking to expand into new markets – which Facebook itself is looking to facilitate through new initiatives – then WhatsApp may well prove crucial, but it’s likely less so for those not seeking to branch out. That said, there are still some 23 million WhatsApp users in the US, no small amount – and as noted, as Facebook continues to shift towards more private communications, WhatsApp will be at the forefront of that push. If you want to get a headstart, and be made aware of the latest features and tools ahead of time, staying in touch with the development of WhatsApp’s Business app could well be worth your time.